Experts have spoken — keyword research is indeed the most vital aspect of digital marketing. It ensures that your content marketing, SEO, and PPC tactics are directed towards the right people — those who are likely to buy from you. While these strategies may take weeks or even months to execute, your keyword research process shouldn’t take nearly as long. In fact, I bet you can end up with a decent haul of keywords in only 30 minutes or less — assuming, of course, you have the right tools and knowledge. And that, my friend, is why we present you with this post. Ladies and gents, this is the 30-Minute Keyword Challenge. 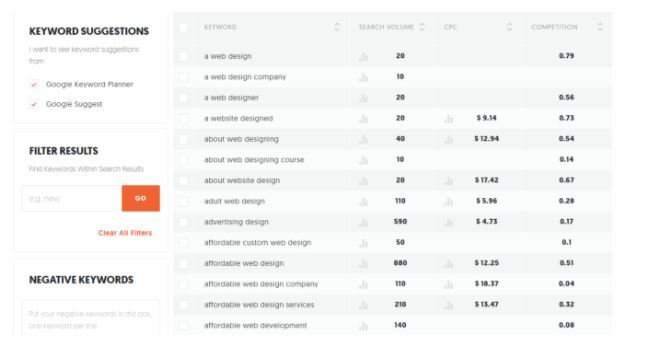 In this challenge, you’ll need a keyword research tool that will work as fast as you. The first and perhaps the only option that comes to mind is Ubersuggest. Because, unlike most of keyword research tools out there, you don’t even need to register for an account to unlock all of Ubersuggest’s features. Now that we got that of the way, the next things you need are a “seed keyword” and any kind of timer. For the latter, the one you have on your phone should suffice. The first step is to expand your seed keyword to get the ball rolling. Simply enter it into Ubersuggest and click “Look Up” to obtain a handful of great suggestions. Remember that keyword competitiveness in Ubersuggest is measured on a scale of 0.0 to 1.0 — with 1.0 being the highest value. A competitiveness rating of 0.64 sounds reasonable if you have a decent budget. Otherwise, a competitiveness rating of around 0.4 should be your cap. Immediately, you should be able to spot great keyword opportunities. Lucky! From the first page alone, you should be able to extract a couple of ideas. Just remember that the results are sometimes a mixed bag. Some suggestions are too competitive, while others are fall flat in terms of search volume. Either way, try to find the sweet spot between keyword competitiveness, search volume, and user intent. The keyword suggestion “affordable web design services” is a great example. Not only does it have a feasible competitiveness rating, but it also has commercial intent. Sure, you may think that a monthly search volume of 210 isn’t a lot. 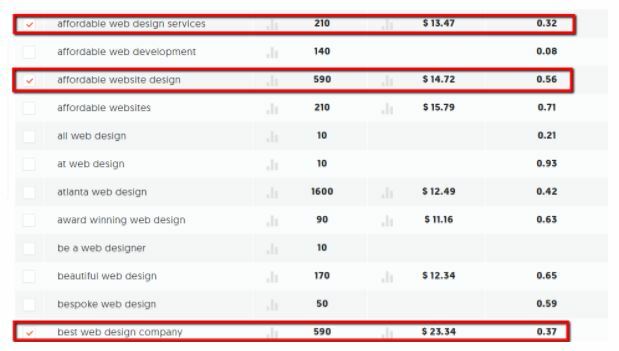 But remember that, as a web designer, landing a single client may yield thousands of dollars in profits. If you ask me, that’s a pretty sweet deal. To finish the first step, let’s go ahead and handpick a couple more keyword ideas. Once your top keyword suggestions are selected, don’t forget to click “Export to CSV” button below — you’ll need it later. Feel free to keep scrolling down until you’ve expanded your seed keyword to any number of suggestions you require. For the sake of this guide, let’s stick to only three. But hey — you have 10 minutes to comb through these results. That should be more than enough for you to find an upwards of 10 keyword suggestions. You can also look to the social media space to expand your keywords. For example, if you enter the phrase, “web design” in Keyhole.co, you’d be able to come up with more keywords that are relevant to your seed keyword. With this workflow, you’d be able to expand your seed keyword in no time. When it comes to keyword research, it’s always a good idea to look ahead. You need to identify which of your top keywords have the most potential for the upcoming months. As you can see, the keyword “affordable web design services” has an overall consistent search volume performance over the months. Sure, the current search volume of 590 is still workable. But if I’m in charge of keyword research, I’d think twice about focusing on this keyword — at least for now. While it already has a decent number of average searches per month, the data shows that it’s still growing. With only three keywords, this entire process should take no more than 3 minutes or one minute per keyword at most. Since you have a 10-minute allowance for this step, you should have enough time to process a total of 10 keywords with little difficulty. After prioritizing your keywords, it’s time to give Ubersuggest another round. The goal here is simple: to find even better keyword opportunities in terms of volume and commercial intent. By indefinitely expanding your top keywords, you can easily come up with as many keyword ideas as you want. But since you already have loads of lucrative keyword opportunities on the table, you don’t have to go great lengths, which is why this step shouldn’t take longer than 5 minutes. Finally, you can wrap up the 30-minute keyword challenge by knowing what you’re up against. You don’t have to do anything fancy at this step — you just need to perform a quick Google search and have a peek at the top-ranking websites. When doing your preliminary competitor analysis, there’s only one thing you need to check: your competitor’s content. Keep in mind that it’s Google’s best interest to provide users with the best content possible that’s related to their search query. In other words, if you ever hope to claim one of these top spots yourself, then you must strive to make better content. Also pay attention to other factors that constitute user experience, such as your website’s loading speed, visual content, call-to-action, and so on. That’s it! Did you succeed in bagging profitable keyword ideas in this challenge? As a marketer, always remember that time is money. While you sit there watching a 30-minute YouTube video, one of your competitors could be out there applying the lessons in this post and being productive. Of course, rest is still important, but it should never come at the expense of efficiency. 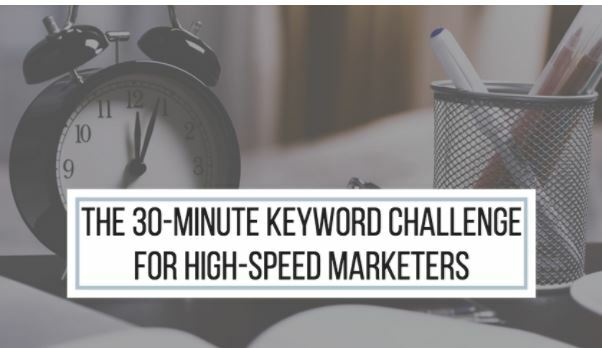 Hopefully, the 30-minute challenge above inspires you to always be in high gear as you do keyword research. Good luck and keep the pedal to the metal!